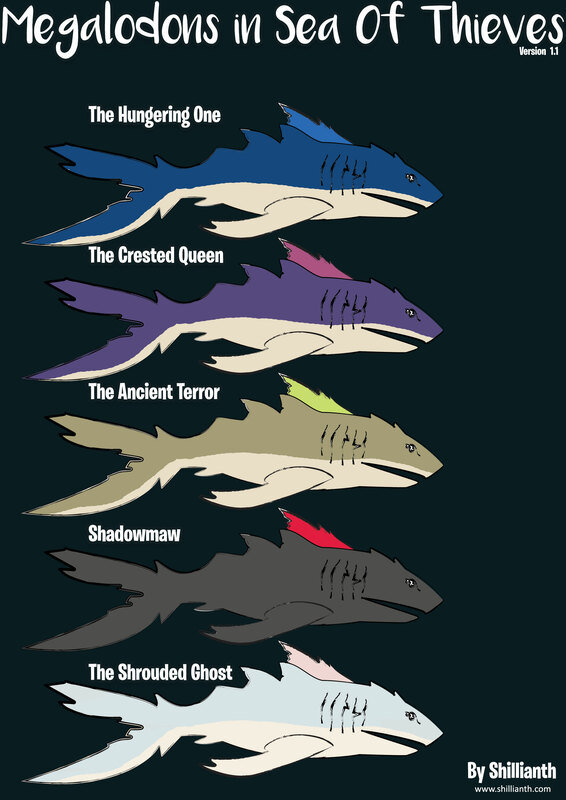 ABOUT: Shrouded Spoils, a free DLC that was released at the end of November, introduced different types of megalodons to the seas. There are 5 different types in total, all using the original model with different skins. The skins are two toned allowing their fins to glow at night time. ATTACKS: They all appear to have the same attacks of charging and biting your ship, creating 2-5 holes in the hull that need to be repaired with planks as quickly as you can. Generally speaking you get a few moments to do this after the bite. If the bite hit a player/pirate, they can deal near fatal and in some cases, instant death, as such it is important to stay fully healed when fighting a megalodon. When you see the megalodon charging towards your ship with their jaw open, the safest place is inside the hull to prevent yourself from being punted overboard however this is also a great opportunity to get some additional shots in, if it is within the cannons range. When megalodons spawn, they are also accompanied by a frenzy of smaller sharks. HOW TO DEFEAT: Set the ship to spin around in a circle (with a little momentum), trying to get the same direction as the megalodon. Shoot them with basic cannonballs. When you hit, your crosshair will show a white X and they’ll growl, flexing upwards in the water. To move cannons quickly, use the A and D keys on the keyboard, sorry XBox users, I don’t know how to do this on your controllers. DIFFICULTY: The difficulty scales with the size of your crew and ship type. Megalodons can appear at the same time as a Kraken and or a pirate ship, fighting one does not exclude you from fighting another. AVOIDING: Sailing in the shallow waters protects you from the interests of the megalodons as they can not reach you there. ENCOURAGING: Sail in deep waters. SIGHTING: Each sighting is accompanied by a distinct growl that alerts you to the incoming danger. RARITY: They also differ in rarity, shown below. This megalodon uses the default model. He has a blue body with a blue fin, that goes fluorescent at night time. She is mostly purple with a purple crest that glows fluorescent pink at night. A black body with a fin that glows bright red. This mega is mostly white/light grey with a fin that glows fluorescent green. Could be described as an albino megalodon during the day. During the day, it’s a light grey with a pink tip. At night, it has a dark body with a fin that glows bright white. Incredibly rare. Given that it can still be a little confusing, I put together a quick little image of the megas that displays their colours. Remember their fins glow of a night time and this changes the colour slightly.